The Warlord returns to full-issue status as it has a story so big it will take every page of the book to tell it. This is the tale that will find Morgan and all of his friends and his daughter Jennifer as well, face off against the Evil One in the age of the Wizard Kings. The issue is action-packed to say the least and Morgan and company have their hands full. It is only because of Jennifer that they even stand a chance against the monster, and when it comes right down to it, it will take all of them working together to bring the creature down. 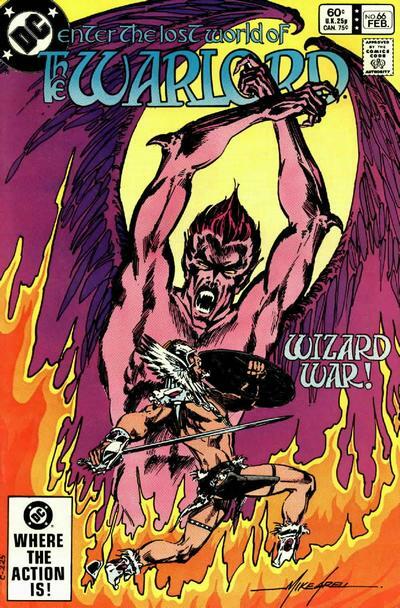 Mike Grell delivers a fantastic issue that not even the terrible humour of Mongo Ironhand can ruin. There are some tense moments in the book, namely between Rostov and Mariah as she tells him what they had all those years ago is over as well as between Machiste and Rostov who each believe they have a claim on Mariah’s affections. Thankfully, Morgan at least stops them from coming to blows, for the moment anyhow. Jennifer still seems a little strange, personality-wise that is. She is colder and distant, almost as if she has lost some of herself in able to do the magic she does. It is hard to say if Morgan sees it in her, but how could he not? Whether this ever gets addressed is a good question, but it may just be one of those things we as a reader have to take as fact. For the last number of issues Dan Jurgens has come on board as penciller and his work has been excellent. The book has gone through a number of artists as Grell is obviously no longer drawing the book and Jurgens has become a fitting replacement. Together, Jurgens and Grell send our heroes into pitched battle and it is one of the most exciting issues yet.